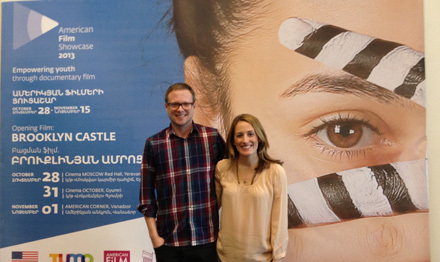 Katie Dellamaggiore, director of the highly acclaimed film, Brooklyn Castle (available on DVD at USCF Sales), traveled to Armenia this fall to screen the movie around the country, in conjunction with the American Film Showcase. Dellamaggiore was impressed by the respect for chess and the level of chess knowledge in audiences. "A couple years ago, I heard about how chess was a required subject in all Armenian schools, so I was always hoping to bring Brooklyn Castle there." Besides the theatrical premiere at South by Southwest, the Armenian premiere in Yerevan was one of the biggest they'd ever had. 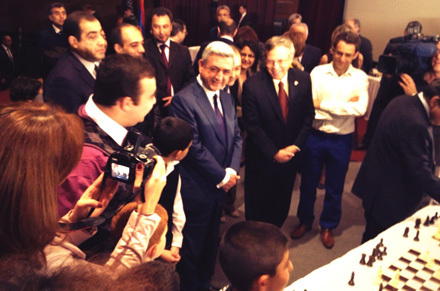 The president of Armenia Serzh Sargsyan, who is also the chairman of the Armenian Chess Federation, attended the premiere. World #2 ranked player, Levon Aronian (wearing blue pants in the photo below), also came. Katie explained to CLO: "Nobody questioned us about the chess part of the movie. People didn't ask us questions like 'How do kids concentrate for so long?'" Armenian viewers were intrigued by the concept of after-school. "They don't have much funding for after-school programs in Armenia so they were blown away by that." The underdog themes of the movie also resonated with Armenians: "Between discrimination under the Soviet Union to the '89 earthquake, 40% unemployment and a barely non-existent middle class, a lot of ambitious and hard-working young people don't want to stay in Armenia." Seeing the challenges that young Armenians face made the outreach aspect of the trip particularly meaningful to Katie and her husband Nelson Dellamaggiore, the editor of Brooklyn Castle. In addition to screening the movie around the country, Katie and Nelson taught students film-making at a workshop at the Tumo Center for Creative Techologies in Yerevan. Katie and Nelson split 20 students into two groups and gave a crash course in storytelling, followed by days of shooting and editing. 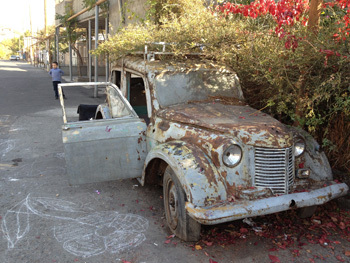 One of the movies explored the story of a rusty car covered in roses. "The car had become a magnet in the neighborhood, and we found the woman who owned it." Her experiences in Armenia reinforced Katie's sense that there is a "new energy in chess. As more people come to chess, Brooklyn Castle will be there for people to watch." Find more about Brooklyn Castle on the official website, twitter, facebook and buy the DVD at USCF Sales.